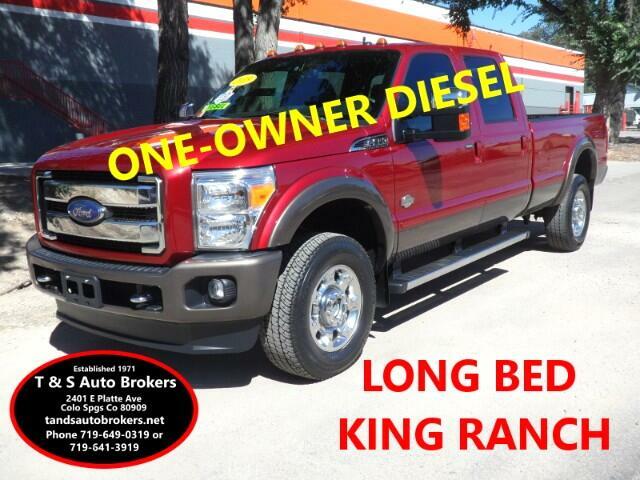 ONE-OWNER KING RANCH, 4X4, DIESEL LONG BED, CREW CAB, NEW CAR TRADE-IN, NOT FROM AUCTION, CLEAN CARFAX. ***TRUCK STILL UNDER THE FACTORY 5 YEAR OR 100000 MILE DIESEL ENGINE WARRANTY AND THE 60 MONTH OR 60000 MILE DRIVETRAIN WARRANTY** ABSOLUTELY BEAUTIFUL TRUCK! WE WILL CONSIDER SOME TRADE-INS. 50K MILES. EQUIPMENT INCLUDES 6.7L V8 F OHV 32V ENGINE, automatic transmission, leather interior, heated and cooled front seats, power moonroof, dual zone climate control, large screen display readout that controls most everything - climate, navigation, radio/CD, phone blutooth, heated seats, etc, AC, CD, satellite radio ready, navigation, Sony audio, dual power seats, power telescoping trailering mirrors, power windows and locks, keyless entry, tilt wheel, cruise control, factory trailer brake controller, exhaust brake, AC outlet, upfitter switches, step-ups, sprayed-in bedliner, backup camera, parking sensors, tow package, alloy wheels, etc. Again, extremely awesome truck, come check it out!